An unmanned surveillance blimp which broke loose from its ground tether in Maryland floated through the air about 1,000 feet about the ground while dragging a several thousand foot tether line just south of Millville, Pa.
MUNCY, Pa. (AP) — An unmanned Army surveillance blimp broke loose from its mooring in Maryland and floated over Pennsylvania for hours Wednesday with two fighter jets on its tail, triggering blackouts across the countryside as it dragged its tether across power lines. Fitted with sensitive defense technology, the radar-equipped blimp escaped from the military’s Aberdeen Proving Ground around 12:20 p.m. and drifted northward, climbing to about 16,000 feet, authorities said. It covered approximately 150 miles over about 3½ hours. As it floated away, aviation officials feared it would endanger air traffic, and two F-16s were scrambled from a National Guard base in New Jersey to track it. But there was never any intention of shooting it down, said Navy Capt. Scott Miller, a spokesman for the nation’s air defense command. Read: Just what is that military craft? ‘‘I honestly was worried that there were people in it that would be injured. A neighbor down the road is thinking it knocked down a tree branch and power pole by his house that could've potentially destroyed his house,’’ Hartkorn said. Wendy Schafer’s first thought upon seeing the blimp near her job at a spa and salon in Bloomsburg was that a nearby school was conducting an experiment. 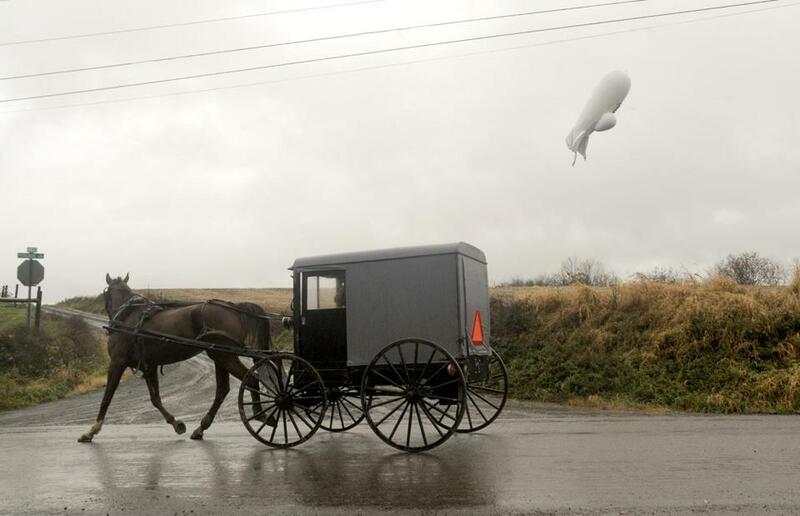 The blimp was operating at the Aberdeen Proving Ground as part of a test of the systems that defend the nation’s capital against airborne attack. The loss of the blimp has not weakened those defenses, Miller said. ‘‘We just kind of scoffed that he had seen a bird or something, and he said, ‘No, look!’ and it was this blimp coming at us from the east,’’ Jarinko said. He said students gathered in disbelief as it passed over at maybe 200 to 300 feet. NORAD released a statement Wednesday afternoon. Associated Press writer Robert Burns in Washington contributed to this report along with AP writers Kristen de Groot and Michael R. Sisak and AP photo stringer Jimmy May in Pennsylvania.